Remember those Pee-Chee folders you’d stuff your math notes in? And how they usually depicted young high school students playing sports or doing other school related activities? I vaguely remember them, but I bet it brings back memories for many Americans growing up in public school systems. 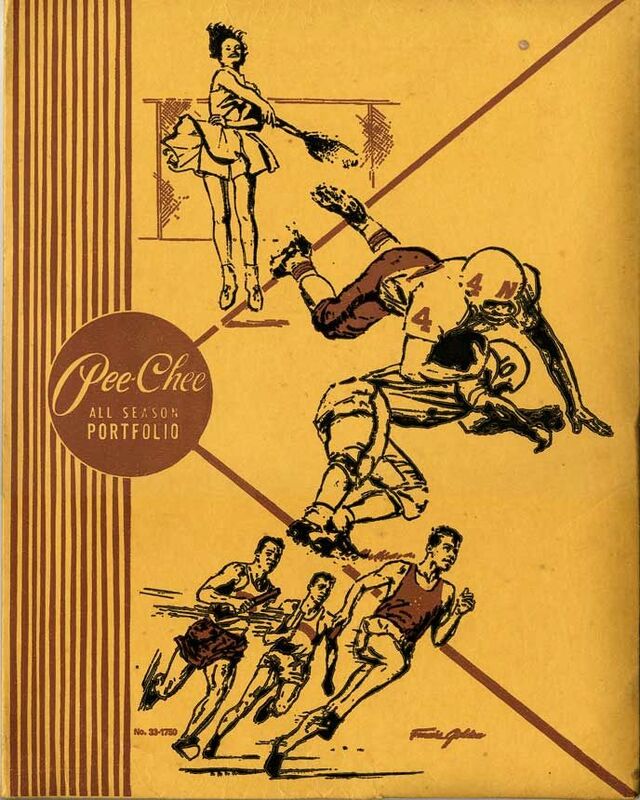 Original cover of a Pee-Chee portfolio. These Pee-Chee folders were first produced in 1943 and immediately became a common American stationary item up until the early 2000’s. The illustrations were done by artist Francis Golden who was best known for his watercolors of fishing and hunting. It is no secret that defacing these illustrations became popular among young adult students. It’s what they do best! But one artist is taking these classic illustrations and giving them a new social political context. Patrick Martinez posing with his re-imagined Pee-Chee paintings. Photo by Liz Ohanesian. Meet Patrick Martinez, a Los Angeles-based artist born and raised in the San Gabriel Valley with a diverse cultural background (Filipino, Mexican and Native American). Through his artworks that span a wide variety of media (painting, neon, ceramic and sculpture), Martinez colorfully examines otherwise everyday realities of suburban and urban life in L.A. with either humor, sensitivity and wit. Take for example, his piece titled, The Most Violent Week in America (2016), an 8’x5′ piece that at a glance looks like the covers of the classic Pee-Chee folders, but when looked at closer, you start to notice that the figures are in the act of some sort of violence. The Most Violent Week in America witnesses the most horrific events that took place in just one week in July of 2016. Starting on July 3rd, 19-year-old Pedro Villanueva was shot and killed by undercover CHP officers in Fullerton who had followed the unarmed teenager from a street racing event to a dead-end street. Two days later, in Baton Rouge, Louisiana, 37-year-old CD vendor Alton Sterling was shot and killed by police officers. The following day in a suburb of St. Paul, Minnesota, Philando Castile, just shy of his 33rd birthday, was shot and killed by police officers during a traffic stop. The next day, Micah Xavier Johnson opened fire on police officers at a Black Lives Matter protest in Dallas. In the top left corner of the painting, you can see the portrait of Castile, which Martinez felt the need to commemorate above all else. In the top right corner, Villaneuva sits on the bed of a pick-up truck holding a guitar, as he did in a photo that accompanied news reporting of his death. Underneath that, Martinez recreated the image of Sterling shot by an officer. Along the bottom, he painted police scenes from Dallas. Photo courtesy of Patrick Martinez, 2005. Martinez has been documenting these instances of social violence in the U.S. since 2015, mostly depicting police brutality and death in the hands of police officers in Pee-Chee style paintings. But his first Pee-Chee piece was in the form of a screen print back in 2005 where he depicted cops chasing a person, pushing someone and running with an armed gun. He showed this work from 2005-2007, then put the idea aside. All American Class of 2016, courtesy of the artist and Charlie James Gallery, Los Angeles. Pan to ten years later after his first screen print, we start to see how technology drastically changes the way news is reported and distributed. For the first time in history, people could use their cell phones to document any acts of police brutality, and upload photos and videos to sites like Youtube and other social networks. This led the general populations to witness firsthand the violent and sometimes lethal force that has been used in cities across the country. Po-lice Misconduct Misprint – Lost Colors Series (pink), 2016. After the deaths of Eric Garner in New York and Michael Brown in Ferguson, Missouri, Martinez says he felt compelled to revive the Pee-Chee concept. “I had reference now,” he explains. And as the news cycle continued to turn out stories of one tragic death after the next, Martinez continued to paint. “There was always content,” he says. But Martinez also looked to the past for inspiration. In “Nine Deuce,” he recalls the beating of Rodney King and subsequent uprising in Los Angeles, with Lakers shades of purple and gold. In “Vintage Throwback Po-Lice,” he pays tribute to Ruben Salazar, the Mexican-American journalist who was killed inside an East Los Angeles bar when he was hit by a tear gas canister on the day of the Chicano Moratorium march in 1970. Photo courtesy of Patrick Martinez. Po-lice Misconduct Misprint – Lost Colors Series (natural blue), 2016. Po-lice Misconduct Misprint – Lost Colors Series (natural yellow), 2016. Po-lice Misconduct Misprint – Lost Colors Series (turquoise), 2016.